Beautiful styling and fine driving dynamics saw the 156 mentioned in the same breath as the BMW 3 Series, Mercedes-Benz C-Class and Audi A4 in relation to desirability. 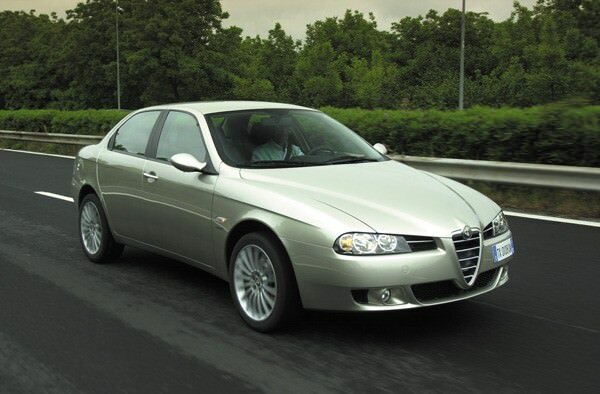 Replacing the 155 in Europe in 1997, the Alfa Romeo 156 was a huge hit for the Italian firm. Beautiful styling and fine driving dynamics saw the 156 mentioned in the same breath as the BMW 3 Series, Mercedes-Benz C-Class and Audi A4 in relation to desirability. That success was short-lived though as Alfa's usual bugbears of poor reliability and patchy customer service meant it didn't retain many of those hard-won customers. That the 156 won the 1998 European Car of the Year comes as no surprise, though the fact it beat the Volkswagen Golf and Audi A6 to do so does rather underline the allure of it seductive lines. As car designs go it's among the prettiest, most nicely proportioned saloons ever, and yet underneath those appealing lines is a car that's got some substance to match its looks. All are front-wheel drive in Ireland (left-hand drive markets were offered a four-wheel drive model) and the engine line-up follows Alfa's norm, so petrol choices of 1.6-, 1.8-, 2.0-, 2.5- and 3.2-litre capacities were offered, the latter two being V6s, while 1.9- and 2.4-litre turbodiesels were also available. The saloon was joined by a pretty 'Sportwagon' model, which added some useful additional rear space - though did sacrifice some practicality for a cool tapered roof and rear styling. Transmissions included five- and six-speed manuals and Alfa's then quite forward-looking semi-automatic Selespeed system. This took control of the clutch in a standard manual gearbox to offer a two-pedal automatic set-up. However, by modern standards the Selespeed's shifts are ponderous and rather clumsy, making the manuals a more desirable choice. The range-topping 156 GTA featured a 3.2-litre V6, and unlike the rest of the 156 line-up missed out on a fairly significant re-style - which changed the front grille for a deeper slatted one, and re-profiled the front and rear lights for sharper, more angular units. Minor upgrades throughout the 156's lifecycle also brought in interior and specification improvements. Space inside is acceptable, though rear head- and legroom are a touch tight and the boot isn't as easily accessed as some. All come well specified though, with alloys and air conditioning, though look out for higher spec models it you want leather upholstery and climate control. With prices so affordable you can be picky, finding the right combination of engine and specification to suit. Engine choice in the classifieds is largely made up of 1.6- and 1.8-litre twin-spark models, the 1.8 offering a bit more go if you need it, though the 1.6 is adequate for most drivers. Be sure to check the service history on all though, as Alfa's petrol engines need careful and regular servicing, and the twin-spark units have a sizeable thirst for oil. Did we mention the looks?